The cast of “A Prairie Home Companion” has been nominated for a Gotham Award in the “Best Ensemble Cast” category, alongside the casts of “Babel”, “For Your Consideration”, “Little Miss Sunshine” and “Shortbus”. The Gothams, which will be presented on Nov. 29 at New York’s Pier Sixty at the Chelsea Piers, also will recognize both Kate Winslet and Edward Norton with 2006 Gotham Tributes. Meryl Streep won the Gotham Tribute Award in 1999. In an interview with the French press to promote “The Devil Wears Prada” last week, Meryl Streep talked about her upcoming role in “Evening”: “I’m making a very small film. I just decided to do it last week and I’m doing it next weekend. I play a very old woman, a friend of Vanessa Redgrave in a movie called “Evening”. My best friend is dying… it’s about an older woman, Vanessa, looking back at her life and it’s a wonderful cast, including… my daughter who is playing me – younger. She has the big part – I have a litte part”. Uniting a stellar cast, Evening begins filming in Rhode Island this week for Focus Features. The Hart Sharp Entertainment production, adapted by Pulitzer Prize-winning author Michael Cunningham from Susan Minot’s best-selling novel of the same name, is directed by Lajos Koltai. The cast of Evening includes Claire Danes, Toni Collette, Vanessa Redgrave, Patrick Wilson, Hugh Dancy, Natasha Richardson, Dame Eileen Atkins, Mamie Gummer, Ebon Moss-Bachrach, Glenn Close, and two-time Academy Award winner Meryl Streep. The drama explores the romantic past and emotional present of Ann Grant (played by Redgrave) and her daughters, Constance (Richardson, who is also the real-life daughter of Redgrave) and Nina (Collette). As Ann lays dying, she remembers, and is moved to convey to her daughters, the defining moments in her life 50 years prior, when she was a young woman (played by Danes). Gummer and Streep, who are mother and daughter in real life, are portraying Ann’s college friend Lila as a younger and older woman, respectively. Click here to read the complete article. According to Playbill, Kevin Kline will play the role of the Cook opposite Meryl Streep in the Aug. 8-Sept. 3 Central Park staging of Brecht’s classic Mother Courage, Playbill.com has learned. He replaces the previously announced Christopher Walken. Walken left the production “due to scheduling conflicts,” according to the Public. Production dates will remain the same. Opening night is Aug. 21. The Kline and Streep casting brings with it echoes of the Public Theater’s 2001 revival of Chekhov’s The Seagull, which featured the two actors. 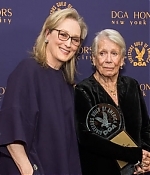 The two are also well known for their pairing in the film “Sophie’s Choice.” Mother Courage will be the first of two Public assignments Kline will essay this year. According to Playbill, Christopher Walken will play the critical role of Cook in the Aug. 8-Sept. 3 Central Park staging of Brecht’s classic Mother Courage, starring Meryl Streep in the title role. Walken and Streep appeared together in the Public Theater’s 2001 revival of Chekhov’s The Seagull, which also played the Delacorte Theatre. Tony Kushner (Angels in America, Caroline, or Change) has penned a new adaptation of the war drama. Kushner’s Caroline, or Change collaborator Jeanine Tesori has created original music. George C. Wolfe will direct. The cynical Cook is one of the mercenary Mother Courage’s few constant companions as she and her children trudge through the bloody and pointless (in Brecht’s depiction) Thirty Years War. Streep caused a sensation in 2001 when she returned to the New York stage after a long absence to appear in a Mike Nichols rendition of Chekhov’s The Seagull in Central Park. Kevin Kline, Natalie Portman and Philip Seymour Hoffman also starred in that staging.